LOS ANGELES (CBS) — “It’s probably the only time in my life that I’ve ever felt helpless,” Mayor Antonio Villaraigosa recalls. The mayor of Los Angeles sat down with CBS2 to discuss, for the first time, a secret he’s kept since childhood. Villaraigosa said he grew up in an abusive home, watching his alcoholic father repeatedly beat his mother. More than five decades later, those memories continue to haunt him. His father left when he was five years old. “It wasn’t just physical – it was the psychological violence, and usually in fits of rage that were associated with drinking,” Villaraigosa said. He said he has no relationship towards his father and does not hold anger towards him either. When the economy crashed the mayor met many boys with whom he could relate. “…And I can almost tell before I ask them about their family situation…because I grew up like they did,” Villaraigosa said. As a boy, Villaraigosa was kicked out of school and had anger issues. He said his mother helped him to turn his life around. She became his role model, each year becoming stronger, and, later, counseling other victims. “Deep inside there’s this feeling of helplessness and this feeling that I kind of failed her by not protecting her on some level,” he said. Now, as L.A.’s mayor, he has used that feeling to protect others. Villaraigosa has secured millions in federal funds and private donations to fight domestic violence through an organization called Safe L.A. Last year, he partnered with the Los Angeles Police Department to add domestic abuse response teams to all 21 police divisions. But fighting the shame is an uphill battle. “They’ll deny anything happened, even though the whole block heard the screaming,” Villaraigosa said of many victims. 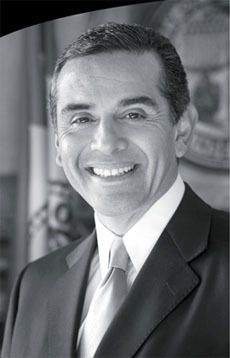 Villaraigosa had recently been elected as mayor when he witnessed a man beating up a woman on a city street. The mayor caught the man but he couldn’t save the victim. She wasn’t willing to press charges. Villaraigosa said he hopes his courage to speak out will empower others to come forward. Mayor Villaraigosa said his new year message, in his mother’s memory, is to stop hiding from his past. For more on domestic violence awareness and how you can get involved visit Safe L.A. online. SCROLL All the Way Down to View More ORGANIZATIONS! Chicago, IL -- 1 in every 3 women are sexually assaulted and 1 in every 6 women experience domestic abuse in their lifetime. The book Married to Himinspires women and teen girls to overcome sexual assault and domestic abuse. Senica Evans is all too familiar with this reality, which is why she wrote Married to Him. It is a true story of her personal experiences with domestic abuse and sexual assault and how she ultimately overcame them. She feels it is imperative that women and teen girls learn "to break the cycle of destruction and shift their mindset from victim to survivor." Evans founded SennySen to empower, educate, and enlighten women and teen girls to overcome domestic abuse, sexual assault and to recognize the signs of destructive relationships. She has a PhD in overcoming destructive relationships. She has worked with several community organizations such as PAVE and FAM Entertainment.